I saw a few recipes for these as imitation Avalanche Bars (sold at the Rocky Mountain Chocolate Factory). This sounded like an amazing twist on rice krispie treats where the treats are held together by peanut butter and white chocolate instead of melted marshmallow. These are SO delicious. 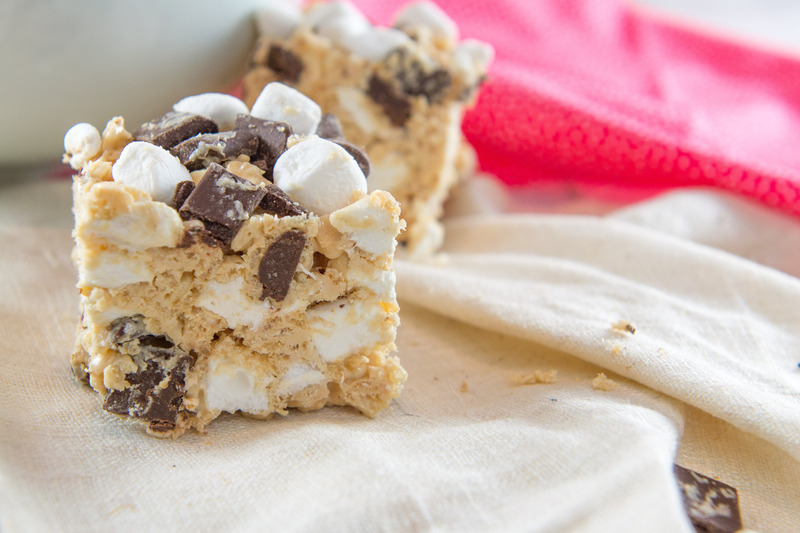 The peanut butter flavor is amazing, the crunch of the krispies with the big chunks of marshmallow and chocolate make for a great treat! Everyone seemed to love these and they didn’t last long. I’m so sad we already ate them all because just typing this up really makes me want to eat one. Combine the white chocolate chips and peanut butter in a microwave safe bowl and microwave in 30-second increments, stirring after each, until completely melted. Stir the Rice Krispies into the peanut butter/white chocolate mixture. Let the mixture sit and cool about 10 minutes, stirring occasionally. Pour the mixture into the prepared pan and press into an even layer. Refrigerate until set, about 15 minutes.